Not exactly Cleethorpes and Katapola, but a bit of Greece is coming to Cleethorpes. 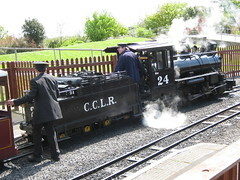 On 26 June 2012 the Olympic flame will be coming to Cleethorpes. 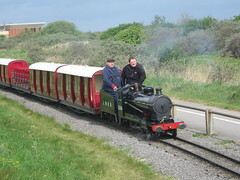 Part of the route is on the Cleethorpes Coast Light Railway a miniature steam railway running near the coast. Call in at the Signal Box Inn, perhaps the smallest pub in the world, at Lakeside station to sample the special beers. And on 27 June (bright and early, at 6 in the morning) the Olympic flame will abseil down the Dock Tower in Grimsby. Grimsby Dock Tower was completed in 1852, and is modelled on the tower in Siena.